The children work together to make a clay chess set for a charity auction. Ages 6 to 13. Plan 2 to 3 Sessions. Click here to view more information about working with clay in a printer-friendly format. Note: Make the chess board before class so the children can coordinate the sizes of the figures. Be sure that the board will fit on your kiln shelf without touching the heating elements on the sides of the kiln. The 16-inch square board pictured in this lesson was cut from a half-inch-thick slab that was rolled on a wooden board to avoid moving or bending the slab, which might cause warping when fired in the kiln. It was then dried slowly, sandwiched between two wooden boards with weights on the corners, and flipped occasionally. An alternative approach is to make the chess board out of wood. When asked to contribute artwork for an auction to raise money for a local children’s charity, the idea of children helping children was appealing. Given the young age of our students, we decided to do something in which each child would contribute a small piece to create a larger whole. 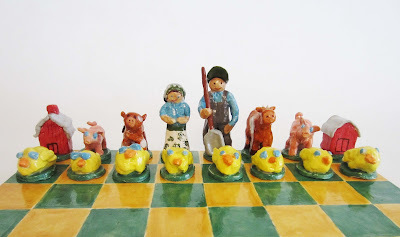 A chess set with familiar characters, such as those on a farm, seemed like a feasible and fun idea. With a “let’s give it a try” approach, the first graders made the chickens, and the second graders followed with the ducks. Excitement grew as the third graders created the pigs, and the fourth through sixth graders worked on the cows, barns, and farmers. The finished artwork is a chess set comprised of pieces as unique and full of character as the children who created them. Taken as a whole, it reminds us of both the beauty of our individuality and what we are able to achieve together as a community . Check the clay several days before the lesson to be sure it has a good workable consistency. Wedge clay into orange-sized balls, planning one for each child plus a few extra. Roll one large slab for the children to use when cutting out stands for their chess pieces. Set out needle tools, containers of slip or water, and the balls of clay. Have available an example or picture of a chess set. Explain to the children that they will be working together to create a clay chess set to be sold in an auction to raise money for charity. Acquaint the children with a chess set and its pieces. Together, decide on a theme, or unifying idea, which will be familiar to all of them, such as a farm, the circus, or zoo animals. Discuss the figures that will be needed to represent the theme and explain that the individual figures must be carefully coordinated for each side. For example, the figures that represent the pawns for one side will need to be similar to each other and contrast with the figures of the opposing side. First graders made chicks for "pawns" on the green side. Second graders made ducks for "pawns" on the yellow side. Have the children work together to coordinate and make the figures. Note: Cover the figures with plastic wrap, loosening it gradually to dry the clay slowly. When completely dry, bisque-fire the figures and the clay chess board in a kiln. Set out bisque-fired figures and chess board. Lightly mark the squares on the chess board with chalk. Explain that in this session, the children will be applying color to their figures using underglaze, a paint for clay. Before giving the children their figures, be sure they understand that bisque-ware, clay that has been low-fired in a kiln, is fragile and must be handled carefully. Demonstrate how quickly the underglaze will dry when applied to the bisque-ware. The children need to dip their brushes often to avoid scrubbing and to cover all areas. They should carefully dab into any cracks or rough areas on the clay surface, brushing away any puddles that may occur. Show the children that they can apply designs directly on top of dried underglaze and that the last color painted is the one that will show. Remind the children that, while playing chess, the figures for each side will need to be easily recognizable. To achieve this, decide on two colors to paint the stands, using one for each side. 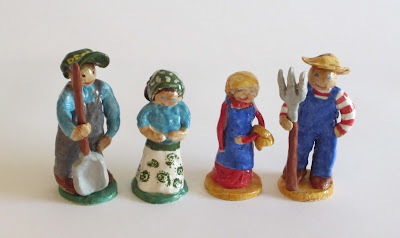 It also helps to coordinate the colors used on the figures, contrasting them with the colors used on the opposing side, such as the green hat and kerchief on the farmer and his wife, and the straw hat and straw-colored hair on the opposing farmer and his wife. Sixth graders made farmers and wives for "kings" and "queens." Have the children apply underglazes to their figures, reminding them to handle the bisque-ware very carefully. As the children finish, have volunteers paint the squares on the chess board using the same two colors used for the stands. When clay is low-fired in the kiln, it shrinks about five to ten percent. Since all the pieces will shrink about the same amount, this should not be a problem. Opaque rather than transparent underglazes are best to use with young children. Mistakes are easily covered and designs can be painted directly on top of the bottom color. Transparent underglazes offer a wider range of colors and can be used by children with more experience working with underglazes. They will need to apply several coats and plan ahead, since lighter colors will not cover the darker colors. In the interest of time, have an adult apply the clear glaze, especially when working with young children. If making a wooden chess board, paint it with acrylic paints to create a hard, protective surface. 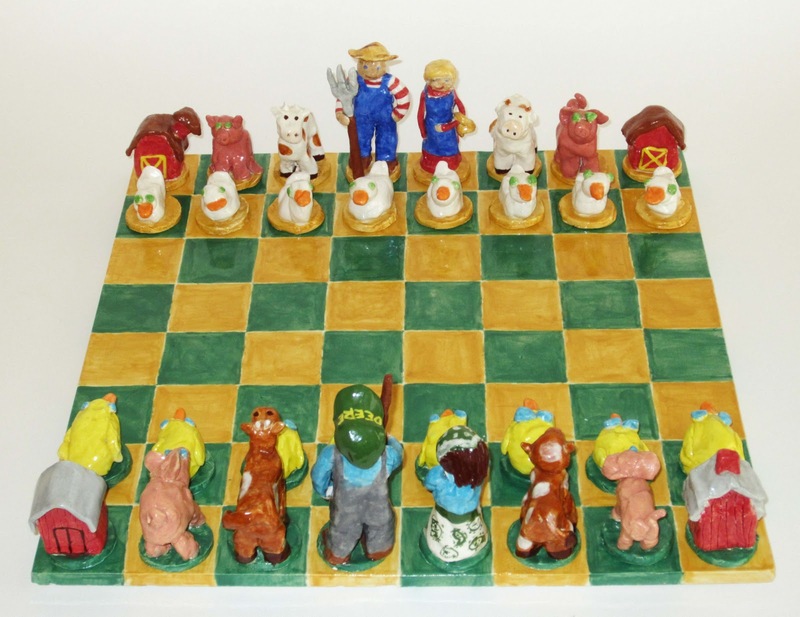 The extra figures that the children make can be included with the chess set as replacement pieces. Are the clay figures sturdy and viewable from all sides? Is the clay carefully covered with underglazes, including the stands? Discuss the details used to make each side easily recognizable. When I try to paint under my chicken, the yellow underglaze drips on the stand. He wants to put a John Deere hat on his farmer. I don’t want to paint a green dress on the farmer's wife. The cow's tail is skinny and I'm afraid it will break off. How can we make our pigs different from the other side's pigs? To paint the underside of your chess piece, try holding it upside down so the underglaze won't drip on the stand. Where drips do occur, they can be touched up with the right color of underglaze. If your figures are on the same team, the colors should coordinate. Perhaps you could paint the dress the color you like and then add a green design. Delicate parts like a tail can be attached along the animal’s body to give it support. The stands for the animals will show us the side on which the pigs belong. You might also use different shades of pink for each side or make spotted pigs for one side. Click here to see this lesson in a printer-friendly format. Fifth graders made cows for "bishops." Fourth graders made barns for "rooks." Third graders made pigs for "knights."